"This project is exciting to me because it brings together three very passionate audiences: the Parkinson's community, sneakerheads and Back to the Future fans," said Michael J. Fox. "With their support we can accelerate our objective of finding a cure for Parkinson's." The Nike Mag shoes originally captured the imagination of audiences in Back to the Future II, when the character Marty McFly, played by Michael J. Fox, wore them in the year 2015. Nike has been urged to release the shoes for many years. 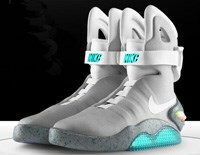 Leading up to the release of the 2011 Nike Mag, a generous US$50 million match grant was given to the Michael J. Fox Foundation by Sergey Brin and Anne Wojcicki. They will match all donations to the foundation, up to US$50 million, through the end of 2012. The timing seemed perfect to bring the 2011 Nike Mag back to support a bigger idea. "We wanted to translate the excitement people have for the 'greatest shoe never made' and for the Back to the Future into positive action," said Mark Parker, Nike CEO, who was on the Back to the Future II set in 1988 when Fox donned the original Nike Mag shoes. "But the long-term objective is to raise awareness so the Foundation can achieve their goal of eradicating Parkinson's disease." The first rechargeable footwear from Nike, the 2011 Nike Mag shoes were designed to be precise replicas of the originals from Back to the Future II. The aesthetic is an exact match, down to the contours of the upper, the glowing LED panel and the electroluminescent NIKE in the strap. The only deviation from the original is additional foam support in the ankle and toe box for increased comfort. The 2011 Nike Mag illuminates with the pinch of the "ear" of the high top, glowing for five hours per charge. The shoes will be available on eBay at nikemag.eBay.com. Each day for the duration of the 10-day auction, 150 pairs of the 2011 Nike Mag shoes will be made available via eBay's Fashion Vault, a differentiated platform for select designer and branded fashion events. The auction ends September 18.